The Dare to Get Dirty Challenges are continuing over at Splitcoaststampers, and today’s card is playing along in three of them. 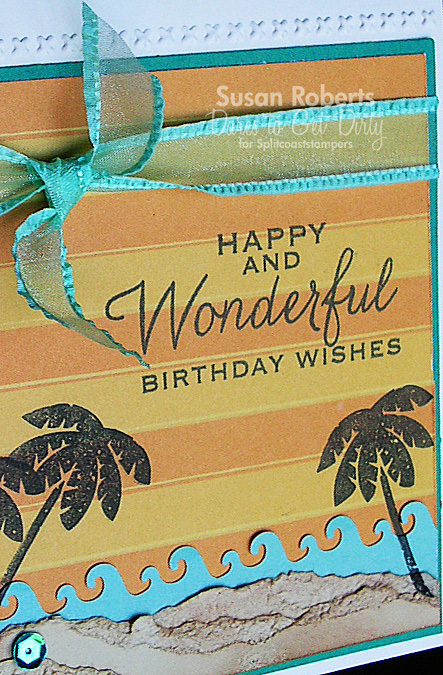 The “sand” in this beach scene was made by tearing four strips of cardstock, distressing it with ink, and layering. There is a row of embossing across the top of the card. I love this cute little folder. Oh, Susan, this is gorgeous and perfect for the challenge (yes, it’s a secret between us Dirty Girls!!). 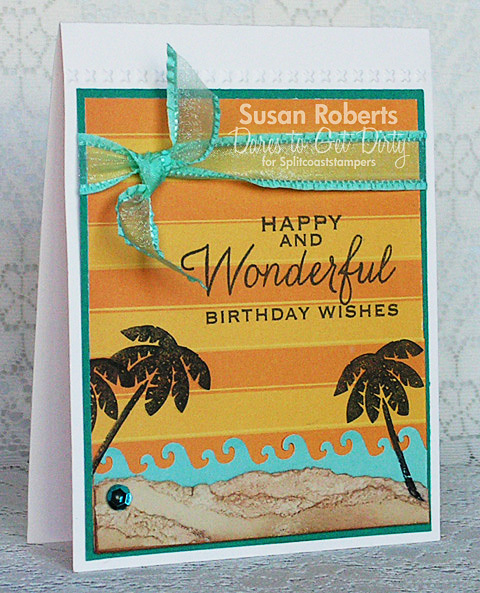 I love the colors and how you made the sand look so real…makes me want to wriggle my toes in it! Having fun this week, and I’m enjoying seeing your cards! Hugs! Gorgeous card! The background is absolutely cool! Love it! Thanks for playing along Simon Says Stamp Anything Goes Challenge! Oh wow I just LOVE how you’ve done your sky!! Really fun Summer creation here!! 🙂 Thanks for sharing! This is a really great summer-time card. Thanks for showing it to me. Your creativity is on a grand scale. Love how you did the sand and the waves behind it, great summer background too!! Oh I love how real the sand looks! Great effect! Love how you gave the sand dimension and texture. Awesome card! Love this card, it makes me smile. TFS. You’ve created such a beautiful beach scene.